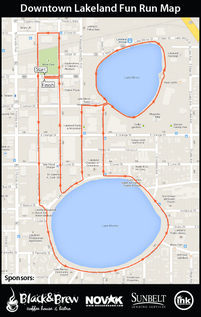 The Downtown Lakeland Saturday Fun Run! At 8:00am meet the group outside of Black & Brew (just South of Munn Park) for a pleasant 3.1 mile jog or walk around scenic, quiet, downtown Lakeland. Enjoy the beautiful wildlife around Lake Morton and Lake Mirror before the rest of Lakeland wakes up! Then socialize over a delicious breakfast and rich, flavorful cup of coffee :) Yum! Done with the run and still feeling energized? Visit the Lakeland Downtown Farmers Curb Market after! Redeem for a free meal or beverage at Black & Brew! ﻿Rotating runners specials every week! Have your company logo Lakeland's Sunday Fun Run! Your company logo will appear on the back of our official tshirt and all promotional material. Hurry there are only 2 spots available! Sponsorship rate is currently $165. All members who have already reached the 10 run milestone will receive a FREE shirt as soon as they are printed.